Our club is a USPA affiliated member and we have a lot of USPA-rated coaches and instructors. 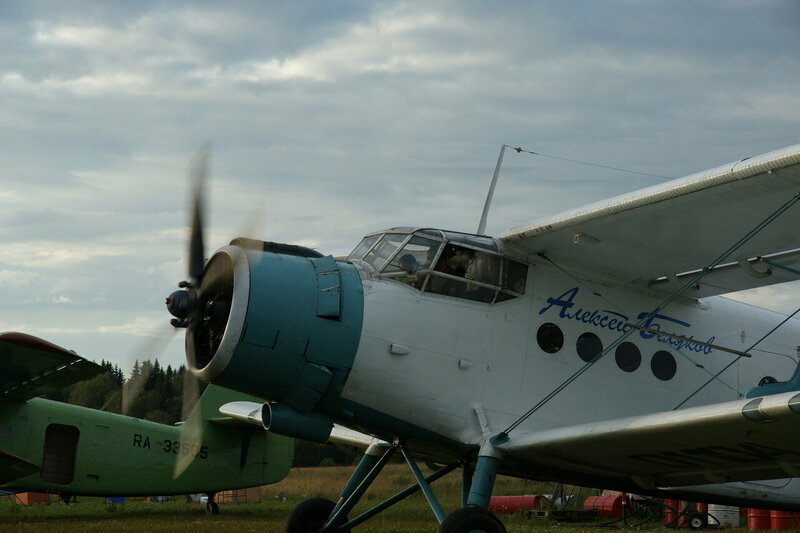 Based on an airfield next to Vatulino village by Ruza, Moscow Region, the Aeroclassica club is a non-profit making club. 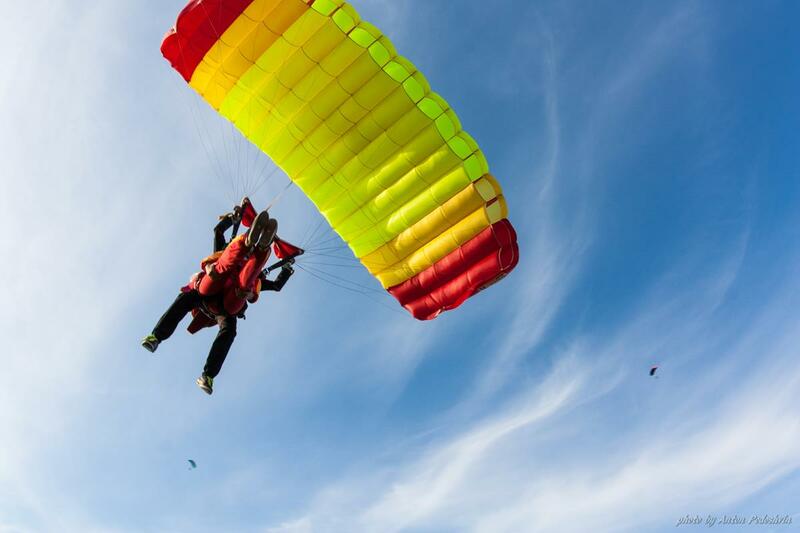 We are dedicated to making parachuting and skydiving safe and fun for everyone interested in and taking part in the sport. 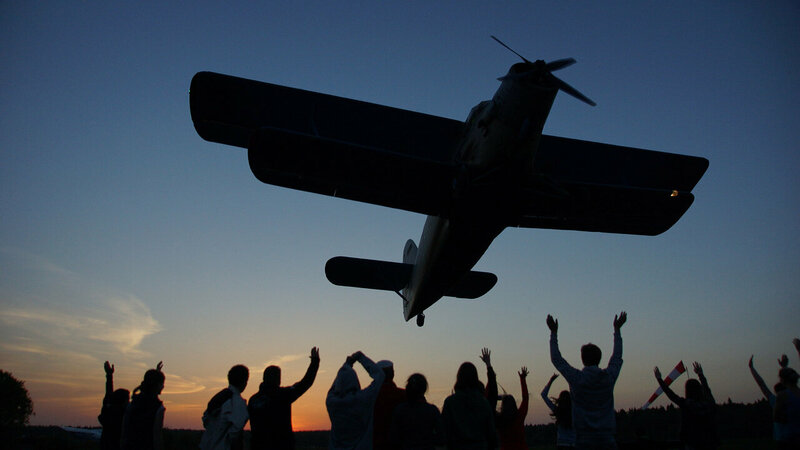 We provide first-time-jump courses and tandem skydives. With your safety and wellbeing as our paramount aim. Open all year round on Fridays, Saturdays, Sundays and public holidays. Any changes in the schedule will be announced in our News page. 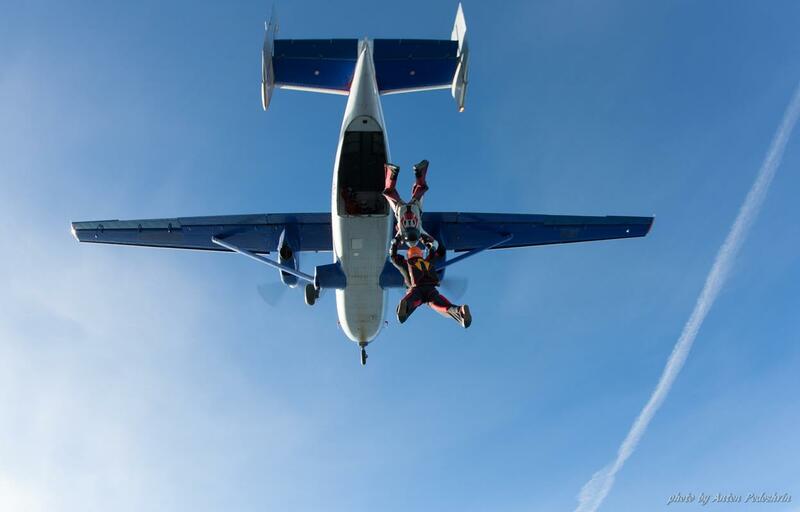 Short NOTE: on Fridays we usually start working in the afternoon and make 1-3 loads if there is enough skydivers. If you plan to come on Friday please call in advance. 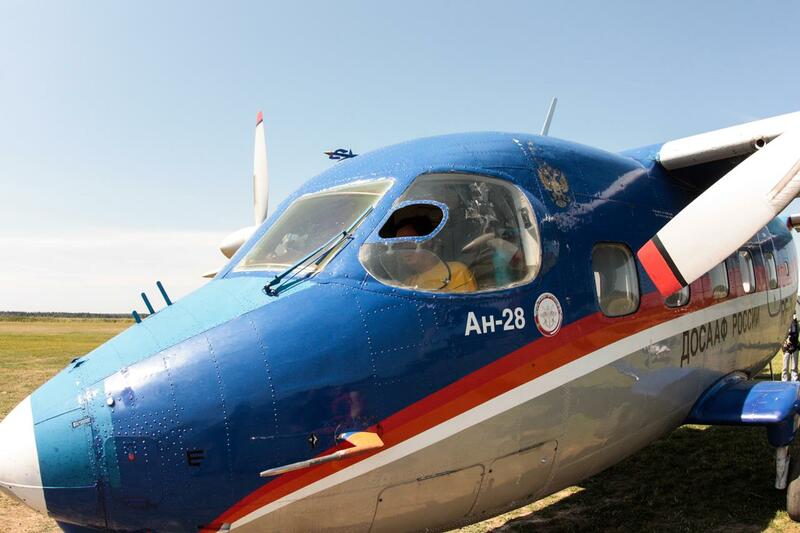 The aircraft we use for our operations are two Antonov An-2 airplanes frequently nicknamed Annushka’s and one Antonov An-28. 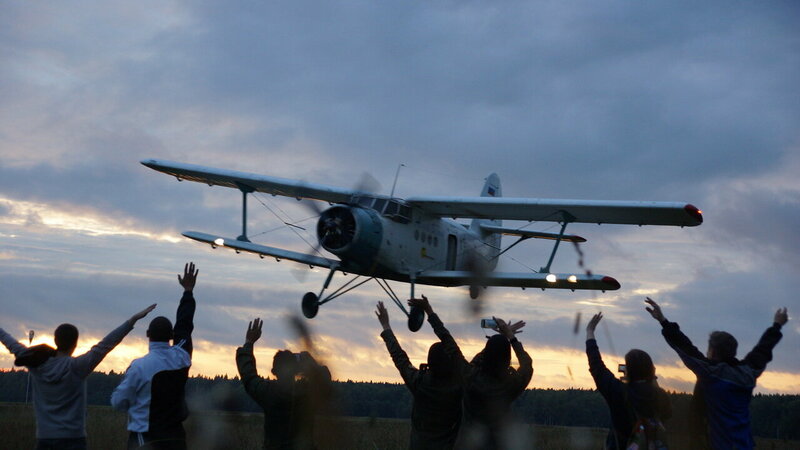 Short NOTE: As you probably know Antonov An-2 is an extremely durable, light, single-engine biplane which first flew on 31 August 1947 and was the first plane designed by Antonov. It is used as a light transport, capable of carrying 12 passengers, and for parachute drops and agricultural work. It’s slow-flight and STOL (short take-off and landing) capabilities make it suited for short, unimproved fields, and some specialized variants have also been built for cold weather and other extreme environments. 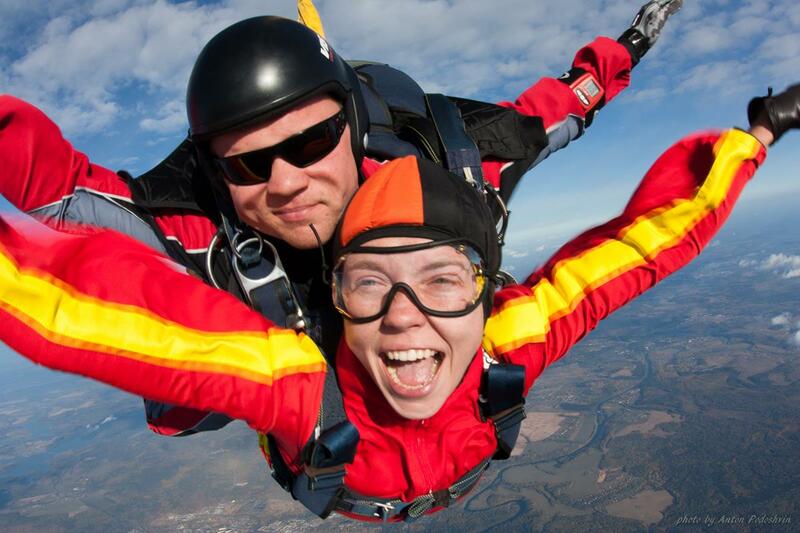 Our First Time Jump Course is designed for those who want to try the experience of parachuting for themselves. 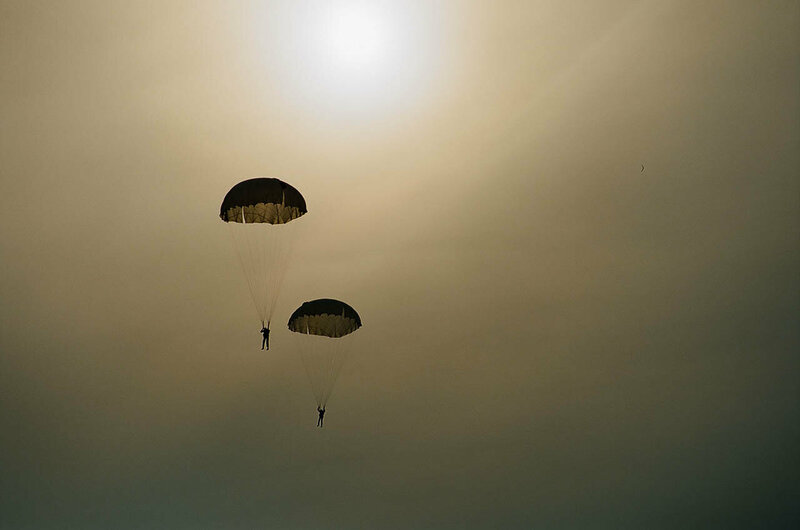 The first individual jump is made with D-6 round parachute system (was used by Soviet Army), which will allow you to remain safe through parachute deployment and landing. You will leave the aircraft from the height of around 800 meters. Your pilot chute (stabilization) will be released automatically by static line and after 3 seconds of free fall under stabilization you will pull the ripcord to deploy your main parachute. This is one of the safest and most exiting ways to experience the true sense of adventure. Courses are run on Saturdays and Sundays and start from 10.30AM sharp (check out main page for working days). Please do not be late, since the ground prep occupies the most part of the day and you will not be allowed to miss a bit of it. Those who are late can enjoy watching others jumping. The course includes 4–6 hours of training divided into theoretical and practical parts. PLEASE at anytime during the course if you feel unsure or not clear about anything you have had instruction for please do not be afraid to ask questions. That is why we are here. Confidence in what you are doing not only makes it safer for you but also makes it more fun. 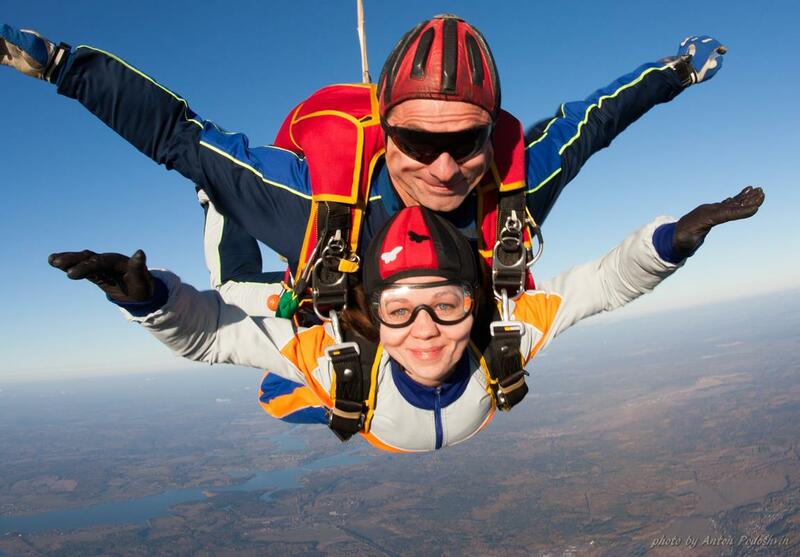 Tandem skydiving is one of the most thrilling ways to make your first parachute jump. Attached to one of our professional tandem jump-master you will exit the aircraft at an altitude of 4000 meters and enjoy a breath-taking free fall. With the tandem jump-master you will feel fully confident during the whole process of a 50-second free fall, safe parachute deployment and then floating to the ground under ram-air canopy. The instruction course takes approximately 25 minutes. Videographers, Wireless Internet Access, Food, Camping, Gear Sales/Rental, Rigging Services, Organizers, Packing Services. Style and Accuracy, Canopy Piloting, FF, Wingsuit coaches (english speaking) are available. 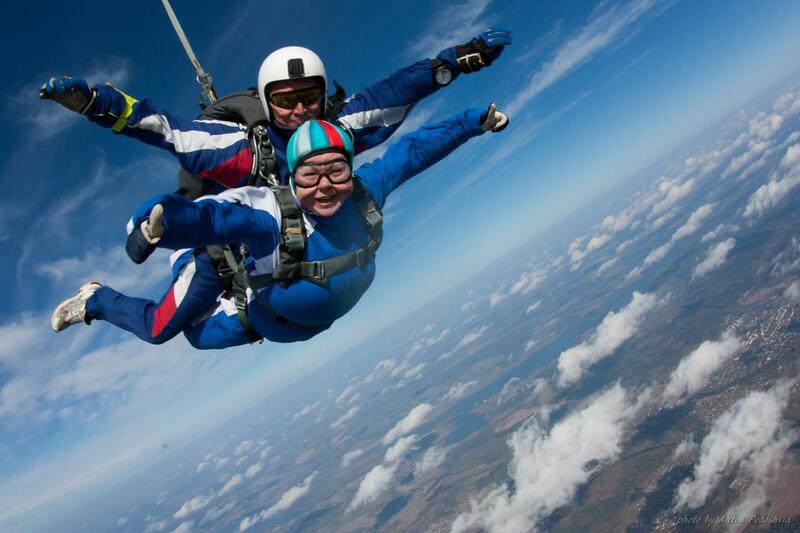 If you skydive on a regular basis we will be happy and pleased to see you as well. 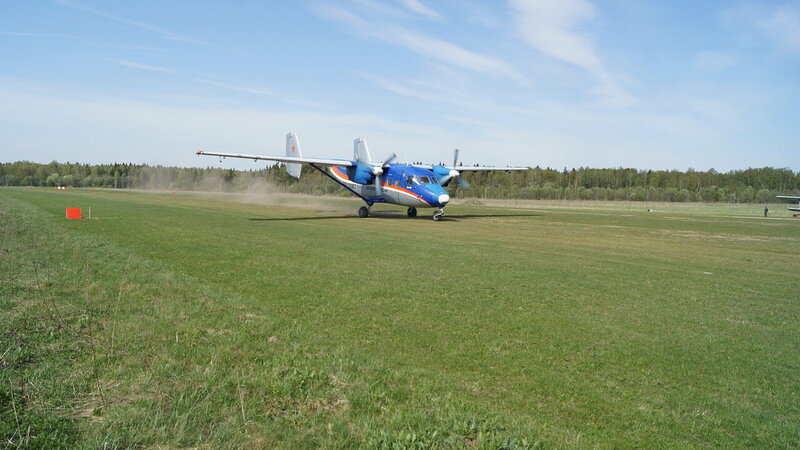 The exit altitude we offer is anything from 1200 up to 2000 from An-2 and from 1500 for hop’n’pop or 4000 meters from AN-28. Please check the Documents and Prices section for further information. Those who are below 18 are allowed to jump only with the prior written consent of their parents. Written consent should be either officially notarized or physical presence of parent / parents is required. Both parents and children should have all the necessary documents with them (passports, insurance etc.). Make sure you have enough money with you and be ready to put a deposit on the equipment for a security deposit should you intend to make an individual jump. 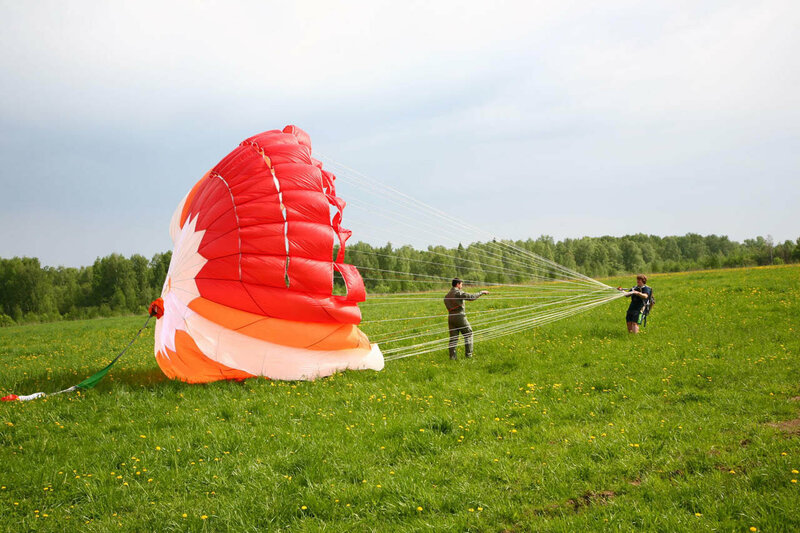 Parachute equipment security deposit (D-6)** 1 000 RUB Refundable! ATTENTION: the cost for the training and the jump must be paid for on the day of the training and this payment is totally non-refundable even if you do not jump for any reason. **In the event of full or partial equipment loss security deposit will not be refunded or only partially refunded. You will be asked to look at and sign several legal forms, which certify that you understand the risk you are about to take. These forms may look scary but they are fully standard. Read them carefully and do not be afraid to ask questions. 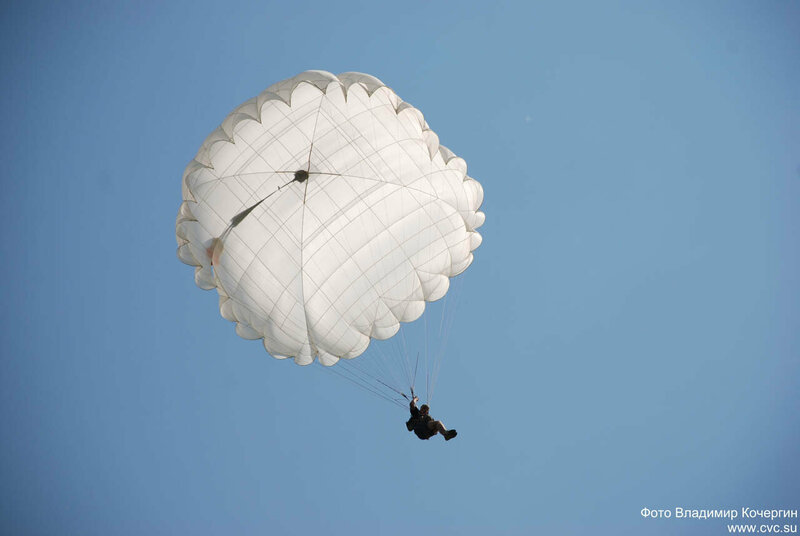 IMPORTANT NOTICE: Despite the best training and equipment, parachuting in any form holds an element of risk and may result in serious bodily injury or death. You voluntarily accept all risks inherent to the sport and agree with yourself and your personal representatives to indemnify and hold blaimless the Aeroclassica club and their representatives against any claim or claims whether on your own account or from third parties arising out of any accident or incident resulting in any loss or damage (including bodily injury and death). If you cannot accept the risks you should not participate. You will need to be in good shape, which means you should not be taking any medication that will affect your coordination or decision-making. Do not jump if you suffer from heart disease, epilepsy, head injury, blackouts, disease of nervous system, high blood pressure, mental illness, drug or alcohol addiction. Before you jump our doctor will check if you medically fit to jump. If you select to perform the individual first time jump please remember the following: Wear (or take with you) long-sleeved clothing and trousers (even if it is +30C in the shade). No high heels, sneakers or flip-flops. Watches, bracelets (any on-hand jewelry), massive earrings etc. Car keys, I-pods etc. (nothing should be in your pockets) The only exception can be made for cell phones which might be very helpful in case you land far away from the dropzone. If you take children with you please remember that they should be under constant supervision of your relatives or friends: not only will they be a danger to themselves but others also. A dropzone is not a playground for kids and can be dangerous. Please avoid bringing your pets with you: a dropzone must be kept clear at all times. consumption of alcoholic beverages, use of drugs before and after jumping smoking outside the «smoking area». All parachute equipments are highly flammable! ...which means that you will have to wait for favourable conditions. Sometimes there can be curfews and jump cancellations due to special events. From Moscow beltway (МКАД) MKAD take Novaya Riga highway (M9) («НОВАЯ РИГА» (М9))1. Drive until you see a signpost for «Mansurovo Kostrovo» («МАНСУРОВО КОСТРОВО») which is approx. 52 km from MKAD3. At this signpost turn left to Mansurovo (МАНСУРОВО). Drive 8 km till you come to a T-junction .At the junction turn left to Onufrievo (ОНУФРИЕВО)4. After about . 25 km there will be another T-junction where you turn right to Ruza (РУЗА)5. As you reach Ruza, drive along till you get to the first junction with traffic lights and «give way» sign (from the left side of the road behind the traffic light there is monument to Lenin — if you see it then you are on course), as you reach the junction with traffic lights turn left to Solntseva str. (ул. Солнцева)6. As you turn you will find yourself in the steep descending road which leads to a junction with a sign telling you that the main road goes to the left. Here you should take the minor road and turn right at the junction, then drive over the bridge (to Mozhaysk — МОЖАЙСК) and here you will leave Ruza behind. As you pass Ruza at approx. 5 km you will see a signpost for Zholobovo (ЖОЛОБОВО) — here you turn right and in a minute you will find yourself driving along the road on the top of a hill and from there you will see white hangars — this is your destination point12. From Moscow beltway (МКАД) MKAD take Minskoye highway (M1) (МИНСКОЕ ШОССЕ (М1)2. Go straight along the highway till you see a signpost for Kapan river (р. КАПАНЬ) then comes «Rosneft» (Роснефть) petroleum station marked by two yellow color columns (on the righthand side of you) and further along there will be a white stela or column indicating Ruza town direction (on the right side of you) — app. 82 km from MKAD. At the signpost Ruza 22 (РУЗА 22) turn right7. Always drive along the main road8. On your way you will pass by Staraya Ruza (Старая Руза) and the bridge over Mopscow-river (р. Москва). As you reach the 14th km you should turn left to Gorbovo (ГОРБОВО)9. Here you will be passing by villages Gorbovo (ГОРБОВО), Lukino (ЛУКИНО), Tishino (ТИШИНО). Drive till you get to T-junction — highway Mozhaysk — Ruza (шоссе МОЖАЙСК — РУЗА). At the junction turn right to Ruza (РУЗА)10. Drive along for approx. 200 m and turn left at the signpost for Zholobovo (ЖОЛОБОВО)11. In about 1 km turn to the left and you will get to the DZ12. In each of two abovementioned directions it will take you 1,5–2 hours to get to the Dropzone. From Belorusskiy railway station (one of railway stations in Moscow) you take the train that goes to Tuchkovo (ТУЧКОВО), Mozhaysk (МОЖАЙСК). It will take you 2 hours to get to Mozhaysk or 1.5 hour to Tuchkovo — ticket price is app. 160 RUB. If you arrive in Mozhaysk you need to take the bus that goes in the direction of Mozhaysk — Ruza (1 hour trip). Your stop is at Vatulino village. Walk through the village and in 15–20 minutes you will reach DZ start point. You can also walk out of the bus at Tishino (ТИШИНО) bus stop which will be a little bit closer to DZ. From Tuchkovo you take bus or rout taxi and drive to Ruza. There you switch the buses to one that goes in direction Ruza-Mozhaysk and make stop at Vatulino (ВАТУЛИНО) bus stop. From the bus station walk through Vatulino village and in 15–20 minutes you will reach DZ. From Ruza bus station you can also take taxi which will bring you directly to the dropzone. It costs 250 RUB. It will take you approximately 40 minutes to get from Tuchkovo to Ruza by bus and the ticket cost is 50 RUB. By rout-taxi — 25 minutes and 50 RUB per ticket per person. At the Tushinsky bus terminal (ТУШИНСКИЙ АВТОВОКЗАЛ) in Moscow (Tushinskaya subway station), take the express bus to Ruza (РУЗА). Tickets can be bought at the ticket desk near the terminal, ticket price is app. 170 RUB. In Ruza, take the regular bus Ruza-Mozhaysk (РУЗА-МОЖАЙСК). Your stop is Vatulino (ВАТУЛИНО). Walk through the Vatulino village and in 15–20 minutes you will reach the DZ start point. You can also walk out of the bus at Tishino (ТИШИНО) bus stop which will be a little bit closer to DZ. From the Ruza bus station you can also take taxi which will bring you directly to the dropzone. It costs 250 RUB.